Let's not dwell on why I haven't had nachos in years, not sure the reason, but clearly it's been far too long. 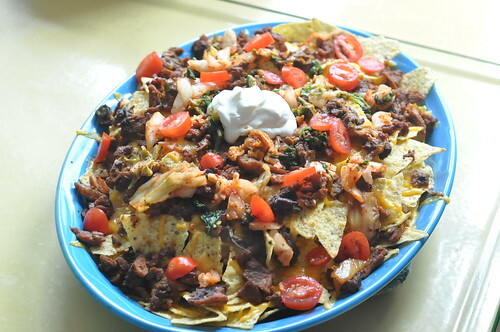 Topped with Korean barbecued pork and barbecued beef, cheddar cheese, Korean-style pico de gallo these nachos are hard to pass up. If you love kimchi as much as I do, then you're going to want to have some of these nachos yourself and STAT. If you can't wait until our book comes out, make a side trip to Kimchi Taco Truck or Kimchi Grill, their new shop in Prospect Heights and tell Phil that Brownie says hi.